The singular mission of the Church is to make disciples. Sadly, most modern Christians have never been discipled, nor have they ever discipled another person. Restoration sees this as a serious problem, so we have placed obedience to the Great Commission (Matthew 28:19--20) as a high priority. So, we admonish every believer to make disciples who make disciples. Don't know how? We will equip you! 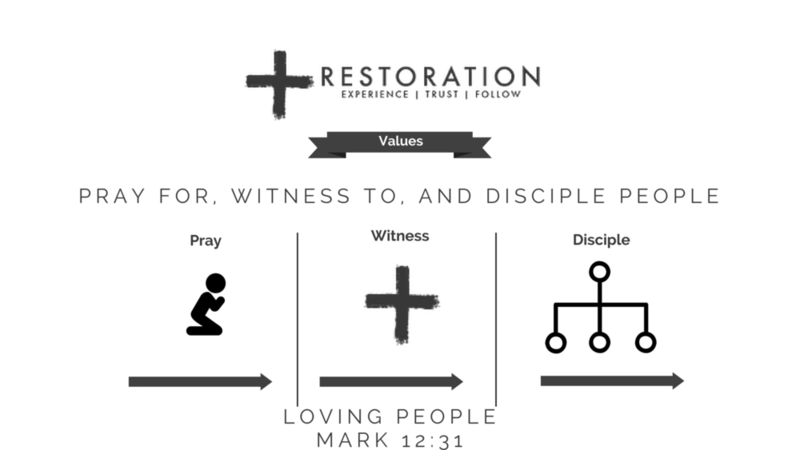 At Restoration, Discipleship Groups of 2-3 people are the nucleus of the church. This is how we fulfill the great commission to make disciples. Discipleship groups start with two men or two women meeting together regularly for prayer, Scripture, and accountability. When a third person the group continued as before. However, when a fourth person comes along, the group splits into two groups. Thus, no group is ever less than two or more than three people at a time. Also, it means that the group continues to make disciples, reaching more people all the time. If you are willing to commit to make three disciples, let us know using the form below. We will pray for you and help you connect with someone(s). Pray: Set three Prayer alarms on your phone. 6:44pm Pray for God to draw people to Jesus (John 6:44). Witness: Tell people about Jesus. Write out your testimony and be ready to share it. Speak when the Holy Spirit empowers you. Disciple: Help people become like Jesus. We also recommend: Life Together by Dietrich Bonhoeffer and Surprised by the Power of the Spirit by Jack Deere, Luke 10, Acts, 1 Corinthians 12-14. We will join together at Good Shepherd Baptist Church (1100 CLEVELAND AVE. AMHERST, OH 44001)with other Scripture believing churches from the area to remember what Christ did to pay our sin debt. This will be a somber service where we acknowledge our great sin and our greater Savior who paid it all for us. Come to worship Christ for His atoning sacrifice. Jesus rose from the dead. His body that was once dead was made alive again. We serve a risen Savior! Join us on Easter Sunday (April 21) at Nordson Depot (671 Franklin Ave Amherst, OH) as we celebrate the Risen Savior. On the First Sunday of every month, all of our house churches come together at Nordson Depot (671 Franklin Ave in Amherst) for a combined worship service at 10am.